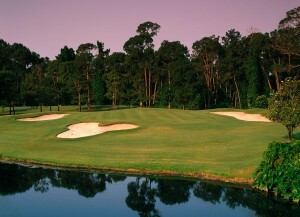 Disney announced today that it will turn its five Walt Disney World golf courses over to a third party for management. It will mark the first time in the resort’s 40-year history that the courses will be run by an outside entity. Arnold Palmer Golf Management will take over the day to day operations of each of the five courses – The Palm, The Magnolia, Osprey Ridge, Lake Buena Vista, and Oak Trail – on September 25. Each of the approximately 330 Disney employees impacted by the move will be offered jobs at comparable pay in other parts of Walt Disney World. The move seems to be a win-win for the company, as well as for Arnold Palmer Golf Management, which boasts personal involvement by the veteran golfer himself. While the golfing industry in Florida has become increasingly competitive, due to the large number of courses that have been built in recent years, it has become tougher for Disney to attract guests with a golfing destination in mind. By bringing in Palmer, Disney hopes to benefit from their exclusive membership group, Palmer Advantage. Members pay a fee in exchange for the ability to play on a variety of the company’s courses throughout the U.S. This deal would not have gotten done if it had not been for Mr. Palmer’s engagement and his desire to associate his brand with the Disney brand…This allows us to reach people that we haven’t been able to reach previously that haven’t considered Disney golf as a destination for them. These are guys that are going to spend not just golf time here, but, because they are going to bring their families, they’re going to spend resort time, too. After 40 years as a golf course architect, I’m looking forward to this opportunity to contribute to Disney’s rich and storied golf legacy. I’ve enjoyed a lifetime of memories playing golf and it will be a great reward to pass that on to those who share a passion both for Disney and the game of golf. Disney had already entered into an agreement to sell its Osprey Ridge course to the Four Seasons, who had planned to build a new hotel on the site. That plan has been delayed by two years, during which time the Palmer Group will operate the course. A sixth course was closed previously to make way for expansion at Walt Disney World. Eagle Pines once occupied the land where the new luxury subdivision, Golden Oak, is currently being built.